Sharing family stories gives little ones a sense of belonging. These stories are perfect to share with your little ones. It provides them with a sense of belonging―a connection to family and the world around them. Research has shown that family storytelling helps children develop a better understanding of people's emotions and supports the development of social intelligence. Children who feel connected often have higher self-esteem and stronger self-awareness. 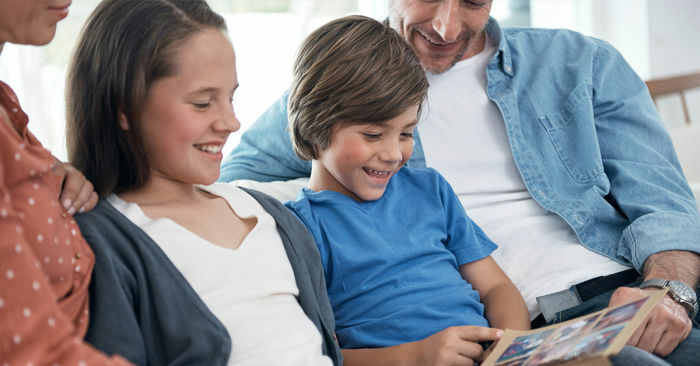 How can you start the family storytelling tradition in your home? Try these 5 fun family games over the holidays when everyone is together. Put your names in a hat. As each family member takes turns drawing a name, he or she will tell a funny or interesting story about the person whose name was drawn. Get out the old family photo albums, or look at the camera roll on your smartphone. Talk about the pictures, what the event was, and tell the story behind the image. Don't let the photos sit in a box or in the Cloud. Share them and talk about them. Ask your child to help you be the family reporter. He or she should put together a simple list of three or four questions and record each family member's answers. This will be a starting point for a lot more stories as well. Have each family member write down one incredible, silly, or interesting fact about himself or herself. Then, each person takes turns reading a random fact while the others have to guess whose story it is. Create a new story together as a family. One person starts the story, and then go around the room, person by person, asking everyone to contribute the next line. The story can be as strange and silly as you want it to be. The main point is to have fun and enjoy talking together. The holidays provide a wonderful opportunity to come together as a family and share your culture, traditions, and history. Make storytelling a part of these festivities, and when your children are grown, they will have these wonderful memories and stories to share with their own children. Visit us on Facebook and share your family's favorite holiday traditions with us!